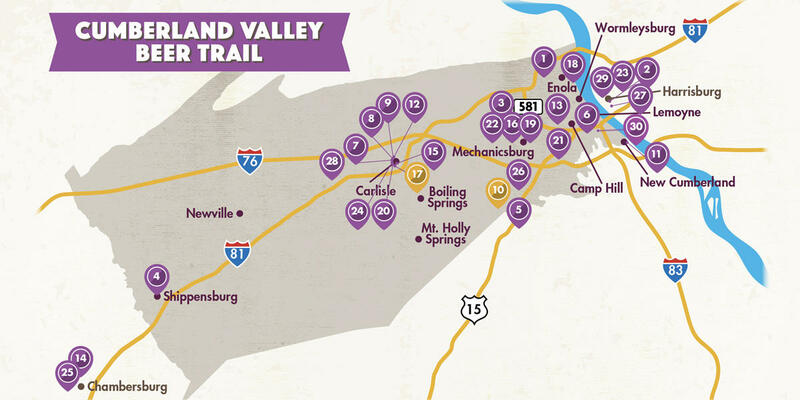 The Cumberland Valley Beer Trail consists of more than 25 locations throughout the Valley including nearby Chambersburg and Harrisburg. Keep checking back for new additions! View individual listings for event information. #28 The Winery at the Long Shot Farm - Located in a quiet country setting only minutes from downtown Carlisle, the tasting room offers more than 10 wines, all made from grapes grown, processed, and bottled on site. The Winery at the Long Shot Farm opened in March 2019. They are currently listed in our printed passport as “Coming Soon”, however, you will still receive a sticker when you visit. #9 Castlerigg Wine Shop - Exclusive wines made available through partnerships with local PA wineries and several varieties of beer from Lancaster Brewing Co.
#30 Vito’s Italian Ristorante - An Italian restaurant making and selling its own line of wine. Vito’s was added as a Beer Trail location in February 2019. Although they are not currently listed in our printed passport, you will still receive a sticker when you visit. #10 Cold Springs Inn & Brewing Co.